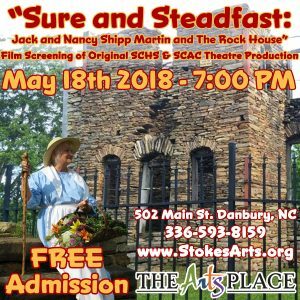 The play is a historical drama based on Nancy Shipp Martin’s life with her husband, Jack, in the Rock House. All characters and their relationships in the play were carefully researched. The content of the play was based on the most current written documented history available to the Stokes County Historical Society in 2011. It was truly a labor of love! The writers, actors, musicians, and director were all residents of Stokes County.